Amazing diagrams for amazing UWP apps. Make your mobile applications stand out in the Windows store with amazing diagrams that are both easy to build and customize. Diagramming for UWP provides your mobile application with a great set of features for creating, customizing and rendering any type of diagram, flowchart, scheme, graph, genealogy tree and many more. The control is very easy to program and boasts an intuitive API that is pleasant to use and learn. To make your job as a software developer even easier the component offers several auxiliary controls, numerous predefined node shapes, various layout algorithms and a long list of appearance settings. MindFusion.Diagramming for UWP offers an incredible amount of style and setting options. You can assign your own mouse cursors, create transparent or invisible nodes or apply embossment and shadow dispersion effects. You can choose among broad range of pen and brush styles and use the customizable fonts and colors. The text in your nodes can be aligned in various styles, HTML-like formatting is also supported. 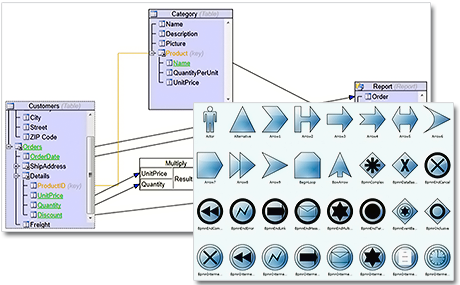 When it comes to choosing the right node shape for your UWP diagram, MindFusion's diagramming component is second to none. 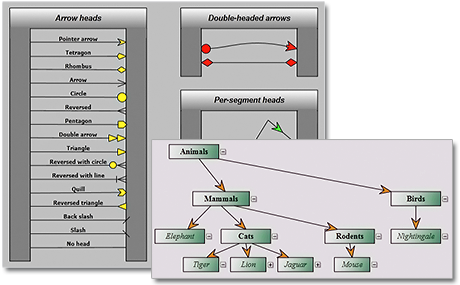 You have more than 100 predefined node shapes and the ability to define custom shapes and shape libraries. Diagram items can be assigned to layers and you can create container and table nodes. Diagram elements can be rotated at any angle. Automatic layout algorithms are a powerful way to dramatically change the appearance of your diagram with a single mouse click. Diagramming for UWP offers you more than 15 layout algorithms - from structural to force directed to topological. You can arrange even the most complicated diagrams in an easy-to-read manner. Each one of the layout algorithms is applied with a single method call.